Many make an open and shut case for not spending $2,000 on one. Update 2:30pm EST: Added more reactions to the Galaxy Fold. In less than two weeks time, you'll be able to walk into an AT&T store and buy a Galaxy Fold for the eye-popping price of $1,980, or $66 a month for the next 30 months. And now we know a little more about what you're going to get for your money—and it might be hard for some people to look past that crease. Samsung has allowed a cadre of journalists exclusive access to the Galaxy Fold, and the impressions were fairly unanimous: The Galaxy Fold is certainly cool but not without its flaws. Journalists walked away impressed with the device as a first-generation product, with TechCrunch's Brian Heater calling it "a pretty solid first take at a new smartphone paradigm" and Jessica Dolcourt of CNET saying the Fold "feels solid and surprisingly premium." However, it's far from perfect, and the vertical crease down the middle garnered most of the criticism. For instance, Geoffrey A. Fowler of The Washington Post said that while he was able to eventually "made peace with the crease" he compared it to the very visible pleat on a pair of polyester pants. Writing for The Verge, Dieter Bohn had a similar experience, saying "you can see the crease from an angle, but it mostly disappears when you are looking at it head-on." However, while he also adjusted to it after a short time, Bohn noted that he could also "feel the crease, which is a little disconcerting." Dolcourt agreed, saying she could "feel the hinge mechanism underneath" while pressing down on the screen, but didn't really notice it when "swiping lightly." However, as Fowler writes, the crease "doesn't get in the way of reading a story or watching a video, and mostly disappears when the screen is lit up." The notch, on the other hand, is another story. Bohn said the notch definitely "does get in the way sometimes," noting that YouTube videos were cut off when in full-screen. However, Samsung has paid a great deal of attention to the way the OS works on the Fold. 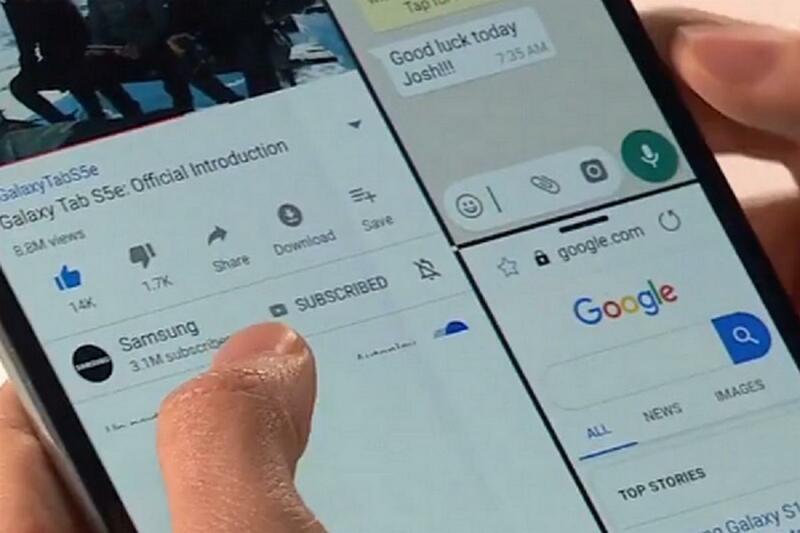 Samsung says you can open three apps at once on the Fold, but support is limited for the new UI. Even apps that are optimized for the Fold, such as Netflix, can be buggy, as Fowler saw when he tried to open an app alongside Netflix and it opened "directly in the middle of the screen." Bohn called the software "surprisingly acceptable," given Android's long history of issues with app and UI fragmentation. Design-wise, the Fold is more of a folding tablet than a phone, according to the impressions. At 9.3 ounces, it's quite a bit heavier than most smartphones out there, and with the thickness of two smartphones, it's going to need a roomy pocket to feel comfortable. However, Heater noted that it's "surprisingly thin" when opened, and Lauren Goode of Wired was also able to use it with one hand when opened to its full 7.3 inches, though she "probably wouldn't want to for an extended period of time." Speaking of opening to tablet mode, that's when the Galaxy Fold impresses most. As Goode writes, Samsung's hinge is excellent on the Fold and easily its best feature: "Unfolding the Galaxy Fold is the whoa-worthy part. This is when it transforms into a 7.3-inch mini tablet. When you unfold it, it makes a sound that’s not quite a click. It’s like hearing a door creak underwater, or listening for an arthritic joint in your own body. It’s addictive. Closing the phone again produces more of a definitive snap." And that's basically why anyone would be willing to fork over two thousand bucks for the privilege of owning the Fold. While all of them were enamored with the Fold, none of the journalists who tried the Fold were willing to buy one, even with a pair of Galaxy Buds and a kevlar case in the box. As Bohn summed up: "There are still plenty of reasons to turn your nose up at the Galaxy Fold, especially at a price of $1,980." This story, "First looks at the Samsung Galaxy Fold are equal parts awe, surprise, and crease concerns" was originally published by PCWorld.